What do you mean by busy.. Always running here and there, continuously answering to phone calls, not taking lunch..? Busyness is not a tool to hide your laziness or fear of failure. For me it makes me more productive. And most importantly, my definition of busyness may be totally different from yours ;). There are many aspects which govern and control the fastness. As per my views, first and foremost thing is planning. If my day is planned, I could clearly feel that difference in my productivity. If each moment is planned (definitely not a static plan, but a dynamic one) and if we have a target time, the work is going to be completed quickly. I would like to be busy always, making every second in my day engaged. And I really enjoy the life when it is fully busy. In fact I feel tired when there is nothing to be done. I can assure you that you will never feel bored if you allow yourself to plan your day. If the control is lost, you are lost and bored at times..
And the second important thing is parallel processing. For me parallel processing is not doing many tasks at a time. As far as we have two hands only, multi-tasking is not easily possible (I won’t say it as impossible, as there may be super humans). And I’m quite sure interruptions in the form of multi-tasking makes us distracted only. Suppose there are two urgent mails to be replied. Our normal tendency is to just start writing the letter taking one by one. And in the middle way only, it will be realized that there is missing information and the person who knows about it, is out of reachable now. So either we fail in the task or happens a lot of que time. Categories: Inspirational | Tags: busy, parallel processing, productive | Permalink. so true..totally agree! multi-task your mind…it has such huge potential, and is more often than not, underutilized!! And yes, if one is un/under-employed, it is best to go to sleep! thanks a lot Hari for sharing the same views..in between why are you not presenting us new surprises through your fiction..
that’s truly wonderful..thanks for your kind words.. I don’t follow a plan for my days but I am ted busy in my life right now and I must say i perform nicely right now still I can do a lot more and I am striving for it. 🙂 wonderful take about productivity and busyness… I liked your views and I loved that you quote Socrates! Me too. When I am busy, I am on a roll. Thanks a lot the nomination Vikram.. 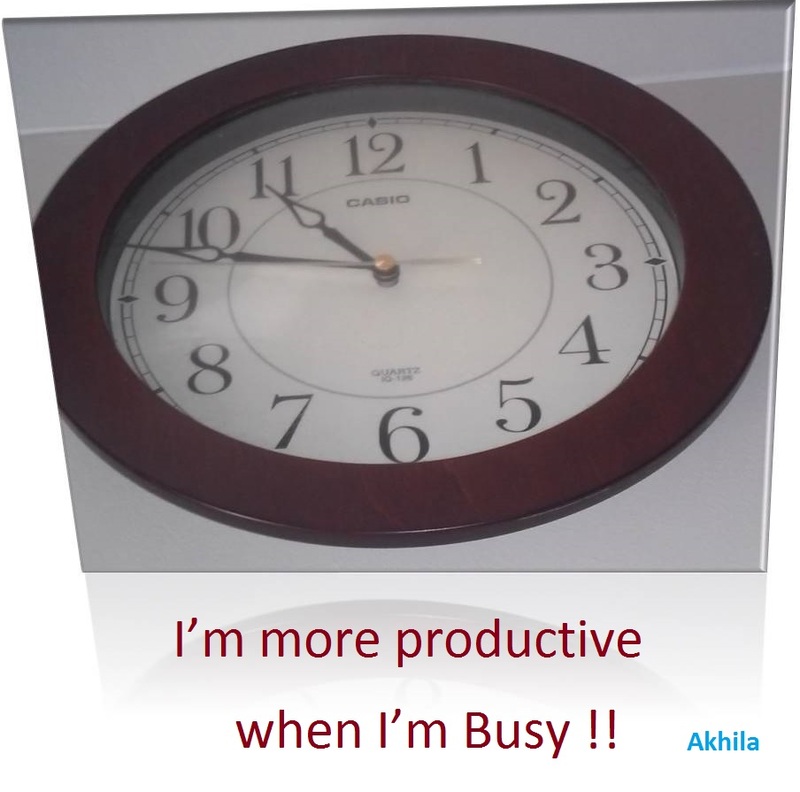 I too find that I am more productive when I am busy. If there is no set plan (set being applied loosely) then my day tends to get away from me, doing this and that but not accomplishing much. I agree, I definitely get more done when I’m busy. Something about how it wakes me up and makes me feel like I need to get things done or they’ll get lost in the craziness. I do like downtime but sometimes too much will make me bored and tired. Happy Holidays! :)–Lindsey V.
thank you.. have a great day!! Ur Welcome,U Too Akhila ji. thank you for reading..Glad that you liked it..:) have a great day!! Excellent post! We are so caught up with a million things that the only planning that we ever do is ‘getting through’ the day instead ‘how to’ get through the day! Lots of difference indeed! oh.. you are really great.. happy to know more about you.. 🙂 enjoy your life with more and more fun…and definitely not forget to have a good sleep.. Absolutely you can also test your limit only when you push yourself to the peak. You said it right.. nothing can limit us untill we think ourselves to be tired.. I am a slow and steady personality. I find this gives me a chance to work a project with greater accuracy. Speed (for me) increases stress and results in the need to repeat actions multiple times. I think each of our constitutions are different. We must trend to a process that works best for our individual needs. Fast or Slow gets the job done. That is probably the most important result. ☺you are right. Fast or slow…it matters the ultimate results only. Having been unemployed has given me LOTS of down time. At first I was very bored since I’m usually a very busy and productive person. I like an ordered day. But then I get into the beat of a new sort of quieter routine. In the less busy of the new time, I found a new freedom and the ability to discover a new me. I could write more, meditate more easily and notice the beauty around me more profoundly. I am looking forward to going back to work and being ‘busy’, but this has been a beautiful gift! Nice… Enjoy your free time..